In 1929 the Dutch Army developed a DC Morse instrument based on the Fullerphone without an internal field telephone. The buzzer/interrupter, a delicate and awkward to adjust instrument, was replaced by a simple buzzer which was mechanically coupled to a microphone acting as chopper. Unfortunately no photo or drawing of the instrument could be found to date. Çircuit diagram of a Fullerphone designed and produced in Holland. 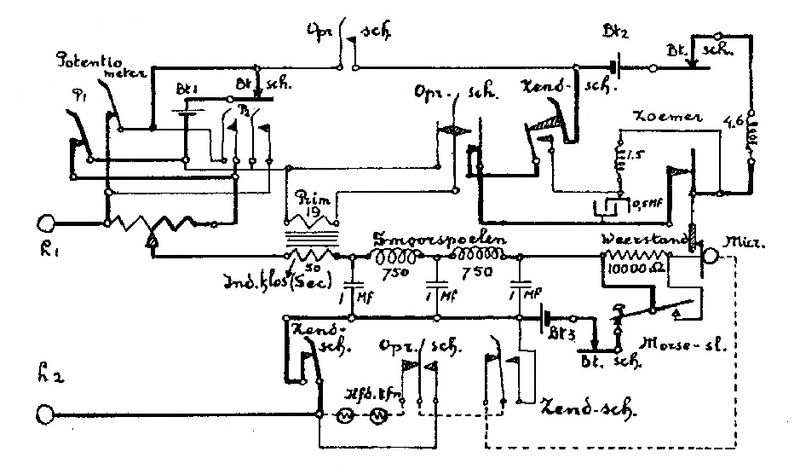 Simplified circuit diagram of a Fullerphone designed and produced by the Dutch Army. This design variation was simple and foolproof, but probably not as sensitive as the mechanical buzzer/chopper used in the British Fullerphones. This was most probably not required.